So at the end of the last post, I had been playing with Marcel Gillen's Rolling Pin puzzles, and ended up with very silver hands thanks to the aluminium dust. That really was the end of the day though and I have missed out a big chunk in the middle, so time to back track a little and fill in the blanks. I had the pleasure to meet Alan Boardman for the first time, and was able to see some of his work up close. 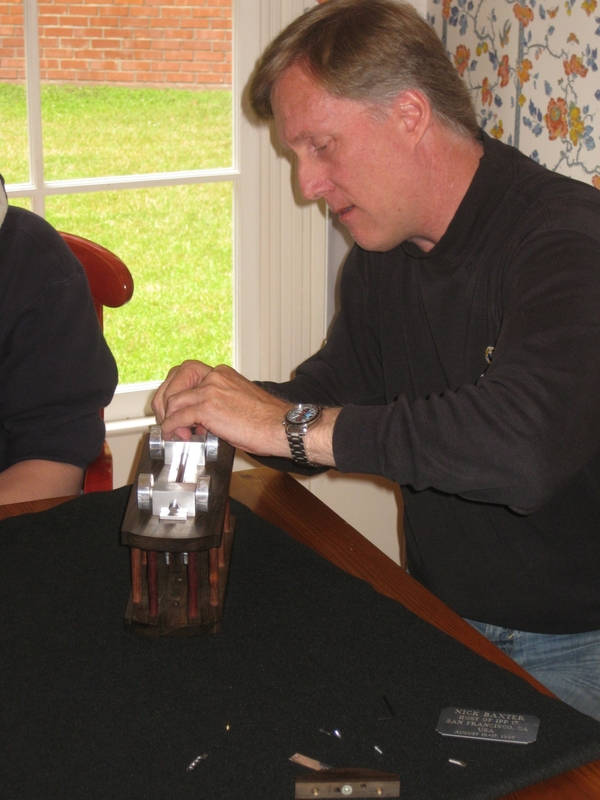 Often with photographs of puzzles, it's hard to tell the size of them, but with Alan, Scale is everything. He considers himself a microxylometagrobologist. 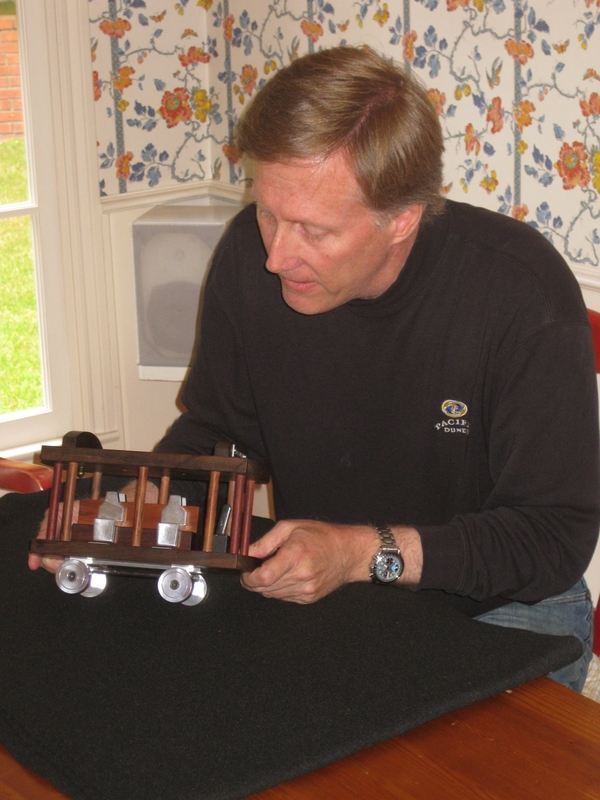 Yes, he makes tiny puzzles. 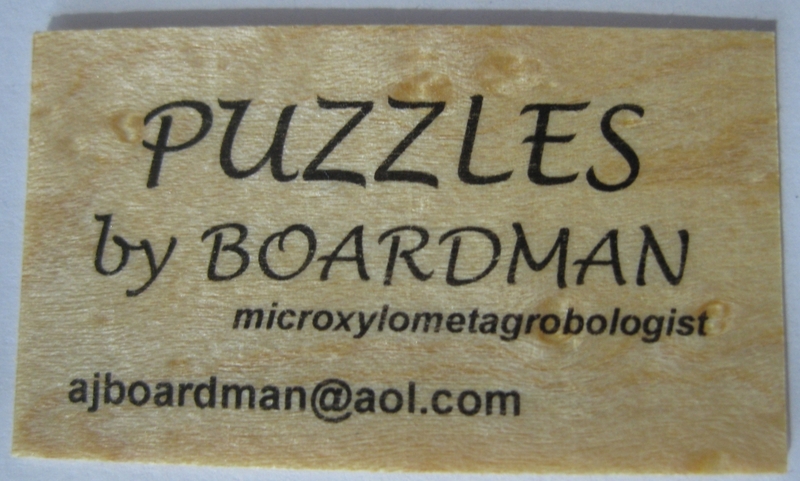 The remarkable thing is that these puzzles, most less than an inch in size, and many less than a quarter inch in size are made with regular woodworking tools, with a level of precision which needs to be seen to be believed. Even his business card needs to be seen to be believed. A beautiful slice of 2ply Birdseye Maple! 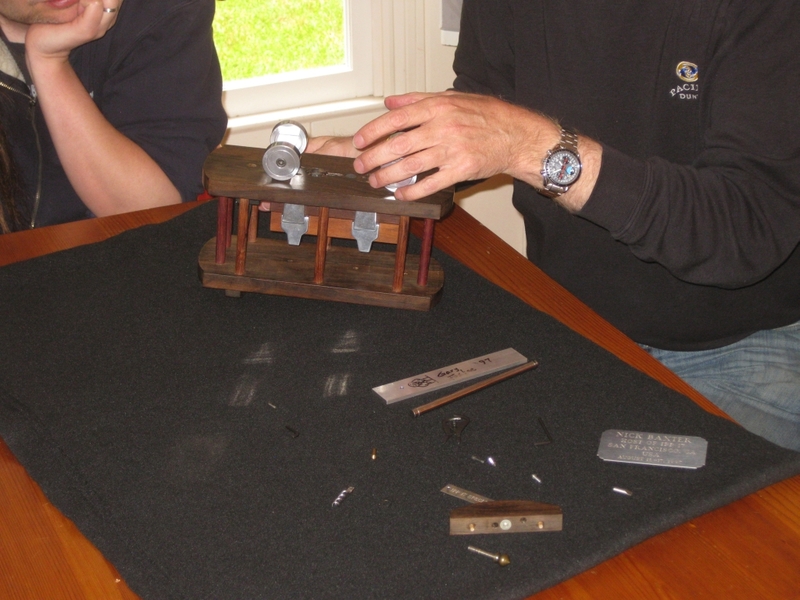 As I mentioned in the first part of the puzzle party writeup, Nick Baxter went through a guided solve of the IPP 17 Host gift made by Gary Foshee. I took photos throughout the solve, and will do a writeup here. Warning, there may be a number of images here showing parts of the sequential discovery where clues as to how to solve the puzzle may be seen. I feel that given how limited this puzzle is, that few people will be able to see or solve this puzzle, and as such I fell less concerned about showing steps of the solution. However if you don't want to see anything, then don't click the link below. I'm glad you decided to continue reading as this really is a special puzzle. Nick started by explaining a little about the puzzle. Obviously it was given to him as one of the hosts of the IPP 17 so this is a very rare puzzle. On the trolly there are 4 people seated each of which has a name tag. One for each of Nick Baxter, Nob Yoshigahara, Jerry Slocum, and Edward Hordern. 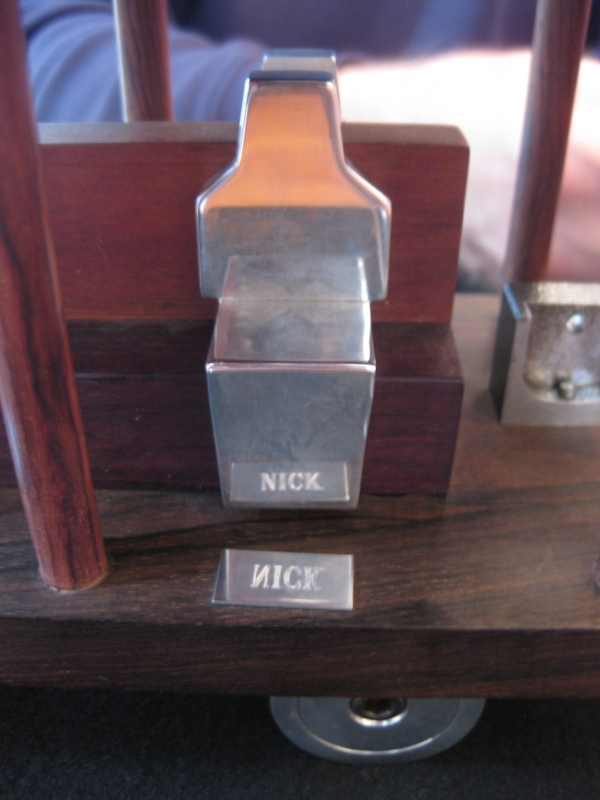 Nick points out that the names are written in plaques under each person's feet so that the name can be read in reflection in the polished people. A very nice touch. 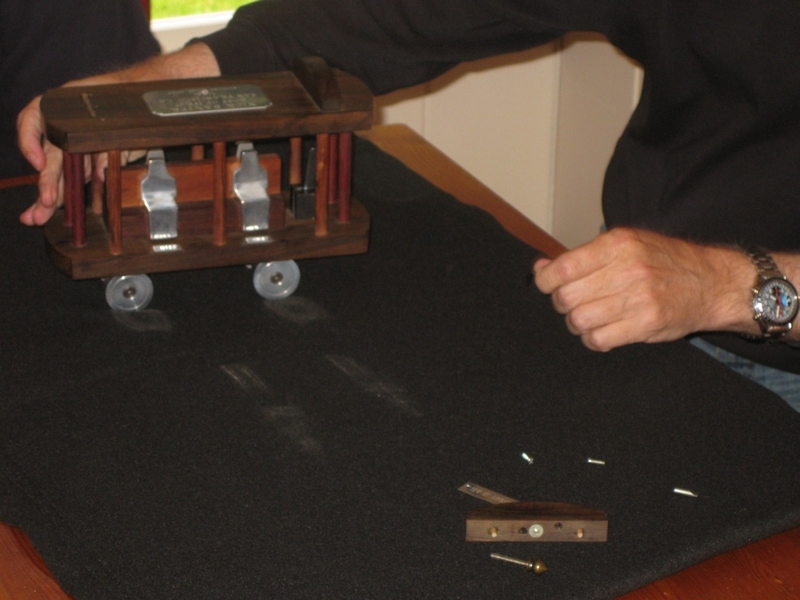 He goes on to explain that the object is to find various tools hidden around the puzzle in order to eventually release the people from their seats in the Trolly Car, where they are currently quite firmly attached. Nick asks for suggestions as to where we might start. 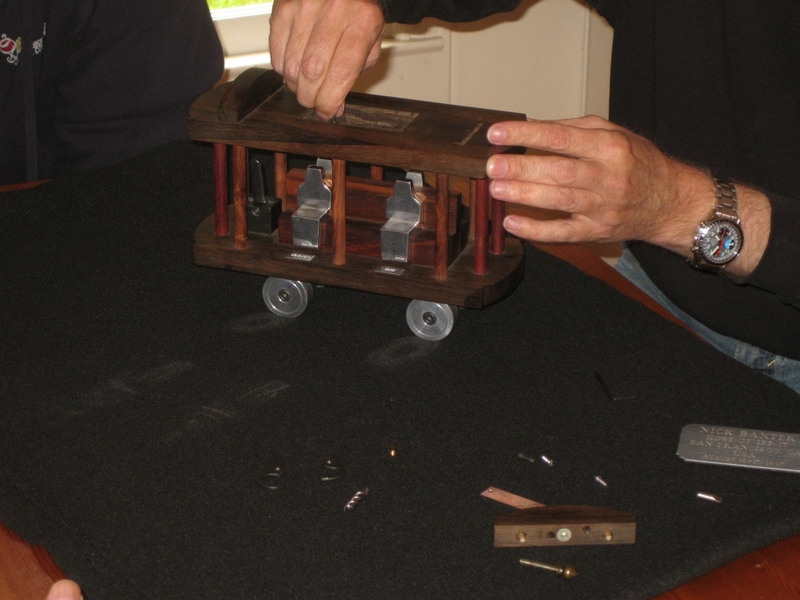 Without too much hesitation, the suggestion of the bell on the back of the tram is suggested, and it is found that it does indeed unscrew. 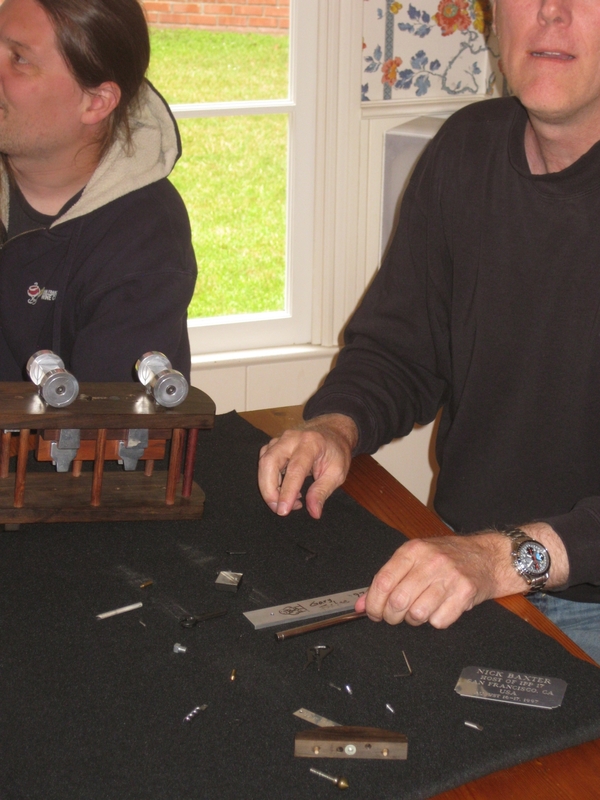 This allows the detail on the top of the tram to be removed and a few tools are revealed in doing so, including a snall screwdriver, which allows one of the silver plaques to be unscrewed, revealing more tools. 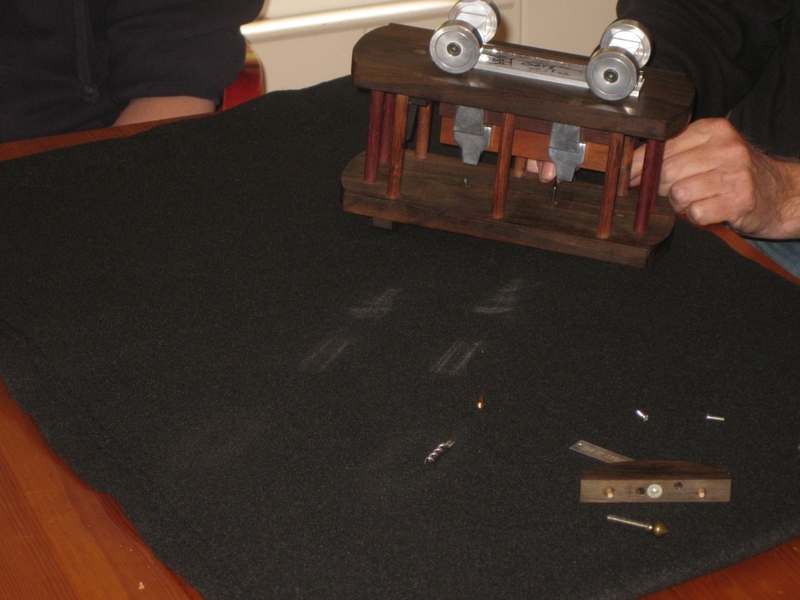 An allen key is found which allows two hex bolts to be unscrewed in the roof of the tram, which in turn allows the main plaque to be removed from the top of the car. This reveals a whole host of tools including what looks like two halves of a pair of scissors, a corkscrew some brass rods and probably a tiny nut that will be useful no doubt. 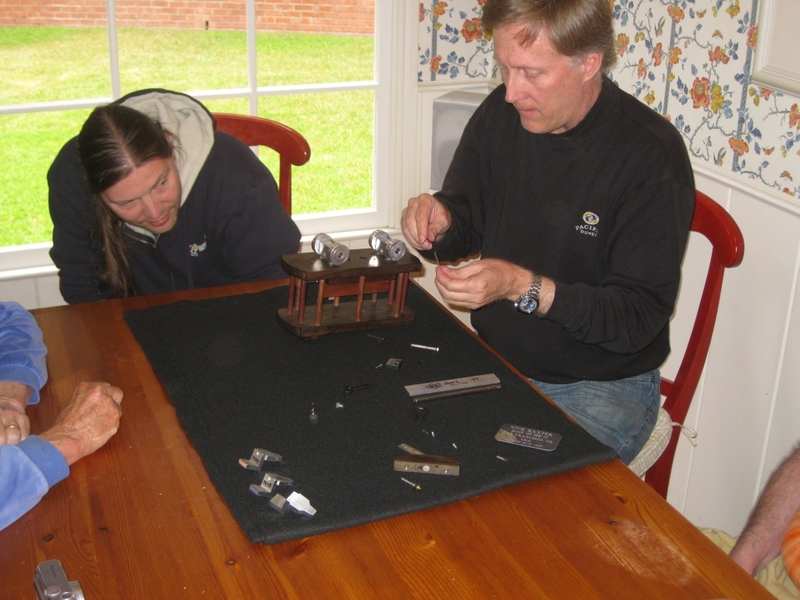 Fairly quickly a few of the bits we've found so far are combined to make more tools, and it turns out that those scissors are actually used to remove spring clips, of which there happens to be a couple holding rod between the wheels on the bottom of the car in place. 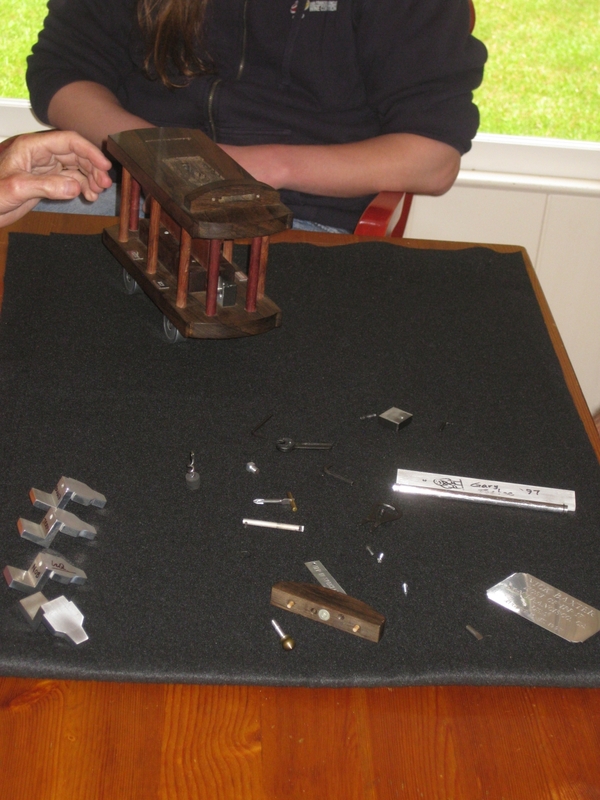 This just shows the number of tools we've found hidden in the puzzle so far ... there's more to come! The spanner allows us to remove a small bolt which had up to this point had no way to be removed, and we reveal a longer screwdriver. We get the feeling that we're getting close, and Nick who's been taking suggestions the whole time pauses to answer a few questions, and joke that he hopes people remember where everything came from! Time to find some way to make a tool out of that corkscrew! 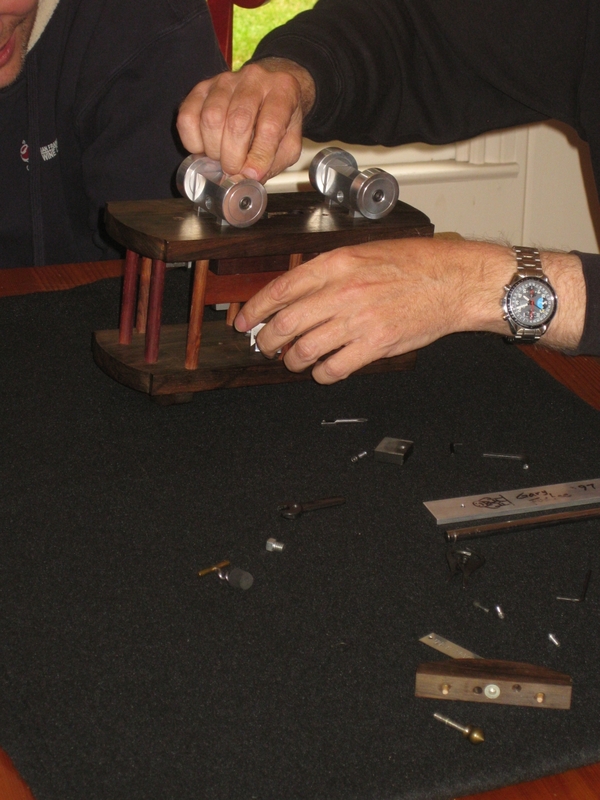 Fortunately the two brass rods are threaded and screw into the top of the corkscrew! Using that on the rubber stopper, even more tools are revealed. This is a great shot showing everything that has been found, and quite a few of the tools combined into their useful forms. When the wine stopper was removed, we revealed a tiny screwdriver which we can now use to remove the first of the passengers. Quick work is then made of removing the next couple of passengers. As Nob is removed Nick comments that Nob signed the back of his passenger, which is a really nice touch. Only one remaining. 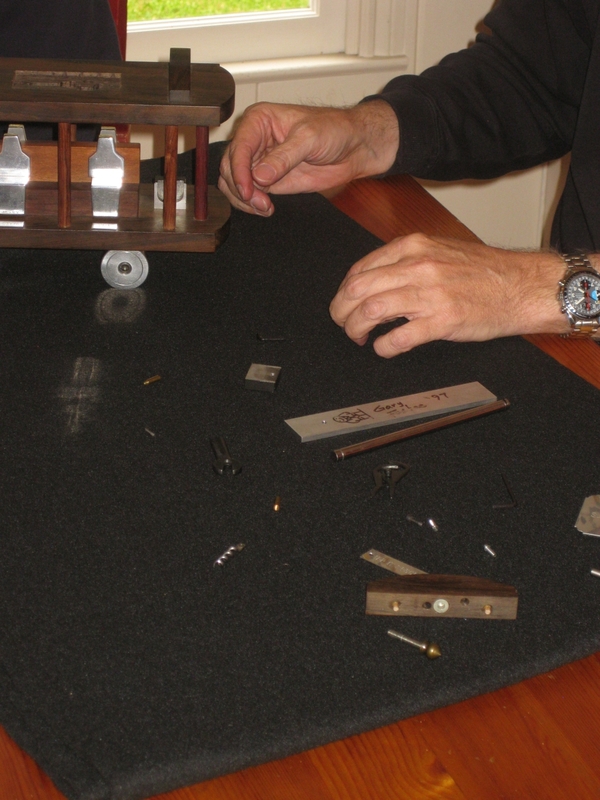 With a quick re-adjustment of a few tools, we make the correct combination to remove the final passenger. So there you have it. 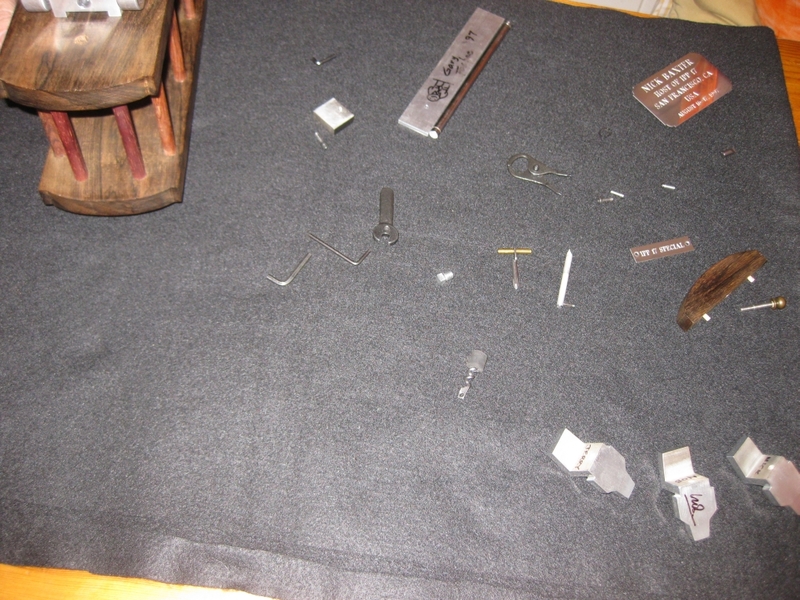 All the pieces removed, and the huge number of items hidded around the puzzle in full view. 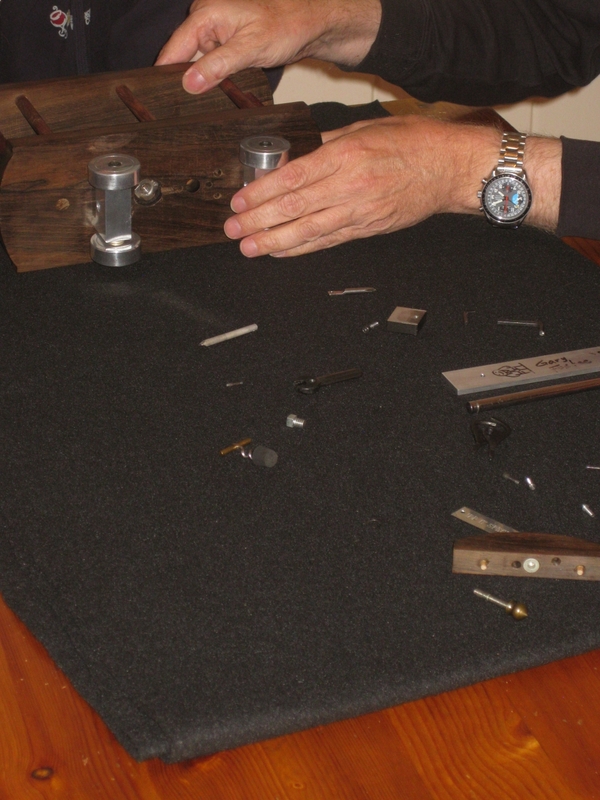 It took around 20 minutes to take this apart, and a lot longer to put it all back together! This is a nice closeup of Nick's passenger showing the way the name tag can only be read in reflection. 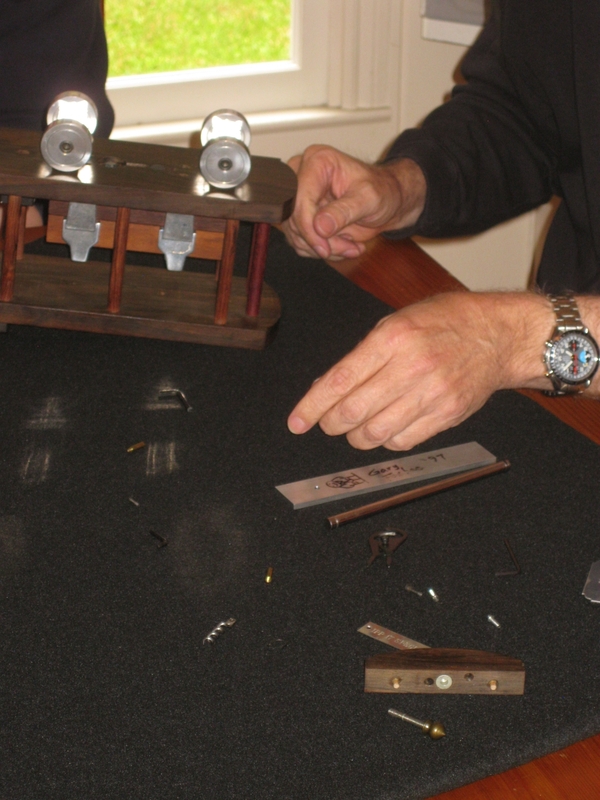 One final shot of all the pieces before the puzzle was put back together, including Gary's signature on the bottom plate of the puzzle. Thanks Nick for letting us see this puzzle in all it's glory. All I can say is WOW! I want one but know I will never ever have one! That was cool! 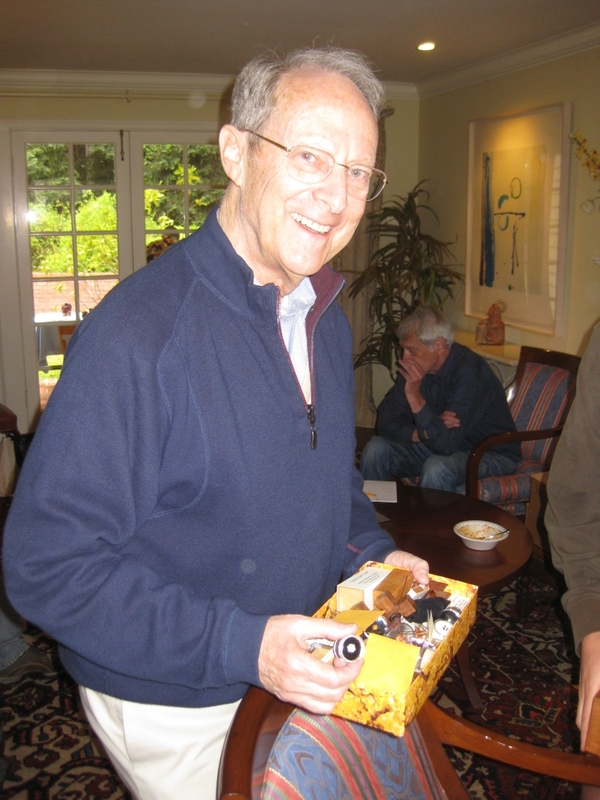 Thanks for sharing that with us, Neil … what a wonderful voyage of discovery and a really thoughtful gift that must mean a huge amount to Nick now. Nice one! Wow, thanks for the description! 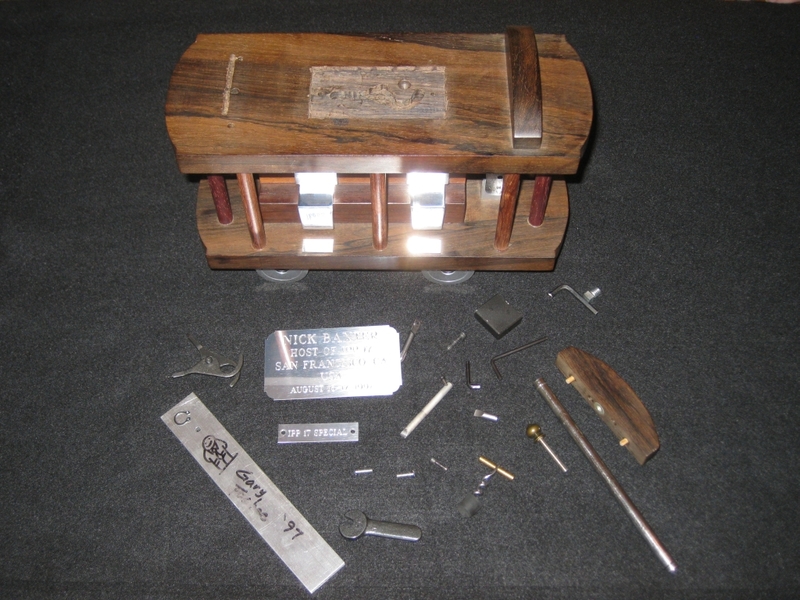 It is my understanding that IPP host puzzles are unique, although there may also exist a “prototype” or perhaps an extra copy owned by Gary Foshee. 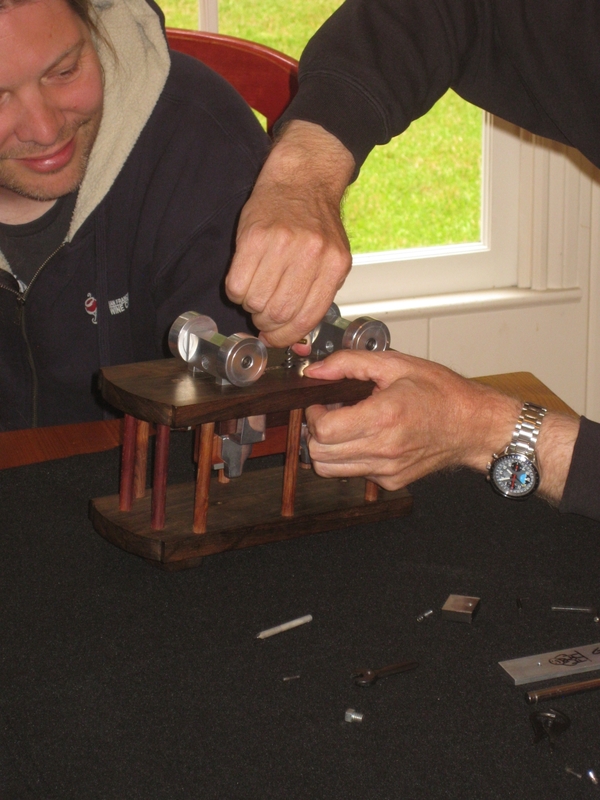 Hosting IPP is a huge effort and it is great to reward such people with a unique puzzle that nobody else will ever have. Came across this post recently and found it fascinating. What an incredible unique sequential-discovery puzzle. Wow!